Learn successfully – whenever and wherever you want! 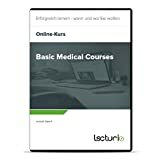 The course “Basic Medical Courses” by Joseph Alpert is an online video course from Lecturio’s medicine section. The course package contains 109 lectures with a total duration of 45:52 hours. For more efficient learning, 289 quiz questions and 102 additional learning aids are included. The device independent availability ensures that contents can be displayed on any smart phone, tablet and PC. Lecturio is an online learning platform with a wide array of offers: within more than 5,000 courses, topics revolving around the fields of knowledge career & success, software, medicine, law, economics, accounting & taxes, languages, health and spare time are explained and illustrated in a user-friendly fashion within online video courses. You get 12 months access to your purchased content.